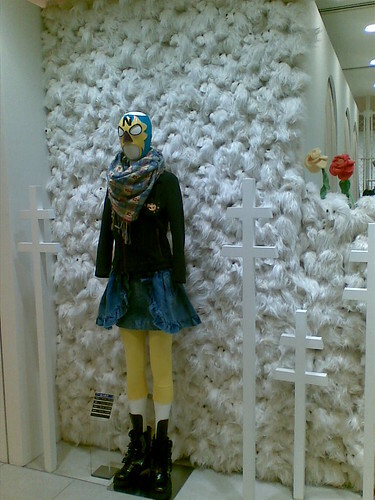 The most Tokyo place in all of Tokyo. The most Tokyo place in all of Tokyo. published on October 24, 2009 Read more posts by the author of The most Tokyo place in all of Tokyo., Snarp2 Comments on The most Tokyo place in all of Tokyo. Several months late, I reveal to you Tokyo’s very soul! It’s basically a grumpy cat in a chair. I hope you’re not too disappointed. 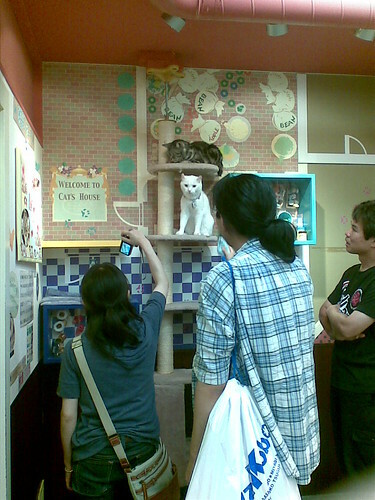 In Tokyo – and I’m assuming in other major Japanese cities, though I never saw them so visible in Niigata or Nagoya – there are these places called “cat cafes,” where you can pay to hang out with cats for a while. 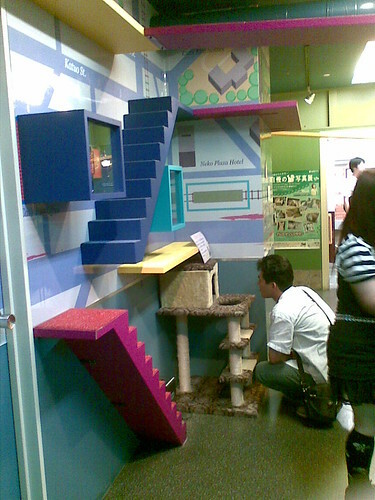 The idea is that a lot of people in Japanese cities who would like to keep pets can’t, because they live in tiny apartments that don’t allow them. 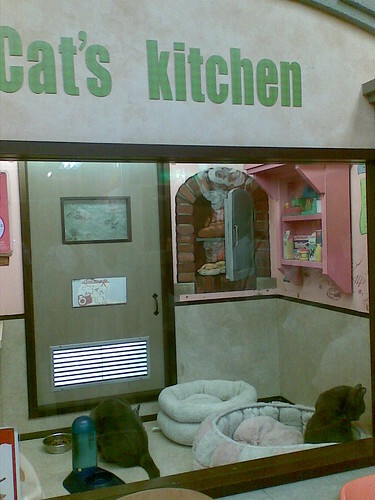 So, they go to cat cafes. Where they mostly encounter this situation. I think this woman had smeared lard on her hands or something. As I think is pretty clear here, the cats are mostly all petted out and paranoid. They do not want to play with the grabby humans. The reason I call this place The Most Tokyo Place is that it is the epitome of the common Japan situation where you’ve got a bunch of strangers gathered together for something that is supposed to be fun, but is clearly pretty disappointing to a bunch of them. So, so as not to drag down the tone for everyone else, the disappointed people studiously pretend to be having fun. They express this by getting out their cell phone and taking a picture. 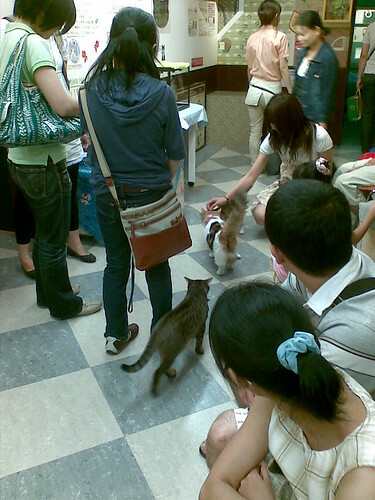 You really don’t get this much in the US, because usually there’s one dude who starts bitching about the money he wasted coming in to see these traumatized cats, and once one person complains, the illusion is gone and no one can reestablish it. 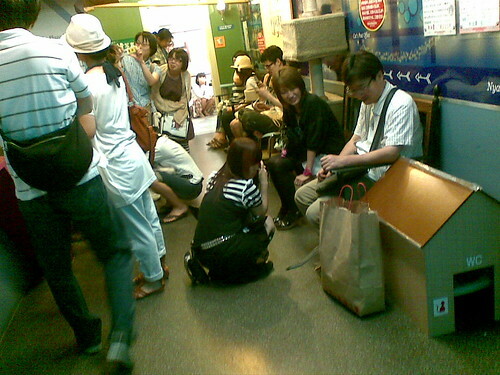 But I very rarely saw a First Complaint in Japan. Some of these people actually were having fun – if I remember right, the glasses-wearing guy in the chair there really got into it, and there were a couple of very excited little girls in there. But they wouldn’t have had as much fun if someone’s bored boyfriend had started complaining, because they’d have felt bad that someone nearby was unhappy, so none of the bored boyfriends did (in my hearing, anyway). 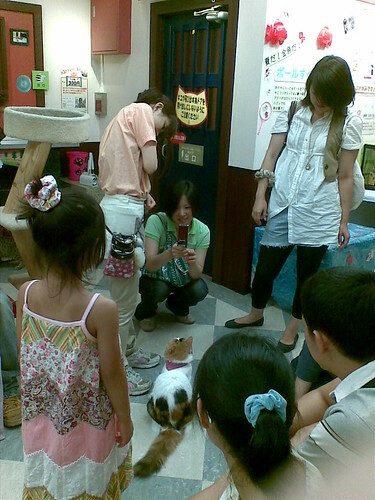 Some of the cats were out wandering around and doing customer service work, but others were in the “cat train” or the “cat house,” I’m assuming to give their nerves a break from all the grabby humans. 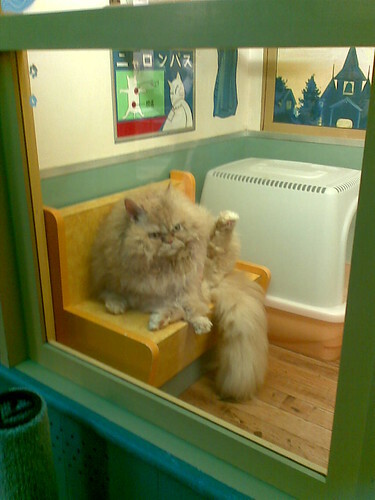 The one outright-grumpy-looking person I saw (at a guess – someone’s boyfriend) was sitting in a plastic chair near the cat train, exchanging glares with the angry orange cat. 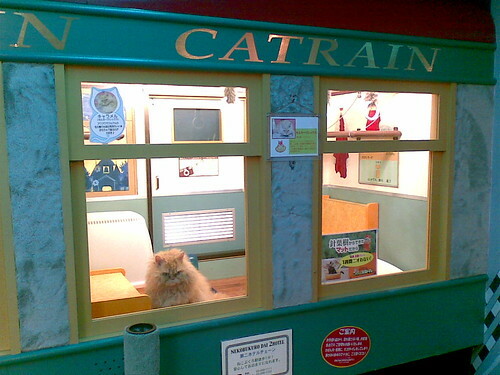 The cat train and cat house consisted of several enclosures, all themed for different parts of a train and a house – the cat house had a living room and kitchen and suchlike, and the cat train had seating cars and a conductor’s car. In conclusion: dude, get your head away from there, there’s a reason that poor cat’s hiding in a tower. And meanwhile, elsewhere in Tokyo, there is a wall of dogs. Previous post: It’s a tradition. Before games, the Chem dept. blows up something symbolic of the other team. Next post: My apartment complex would have yelled at me if I’d actually done this. this is hilarious. i rarely laugh out loud to blogposts, but i did to yours. i would like to pay some money to stare at that grumpy, orange cat-lump. Go to Nekobukuro! They are waiting for you! 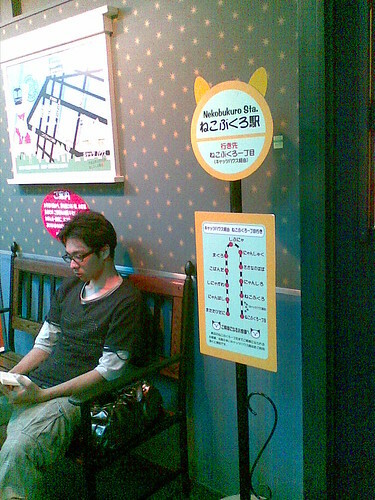 They will charge you 600 yen!